INDIANAPOLIS (AP) LaVall Jordan spent the last five months getting reacclimated to Butler basketball. He proudly shouted the school’s trademark cheer. He became the trendy choice for fundraisers and fan events. He went overseas to scout his own team, and now the 38-year-old basketball coach is ready to put his stamp on the Bulldogs. After a decade away, it didn’t take Jordan long to feel at home again inside Hinkle Fieldhouse. ”There’s nothing like cheering for the Bulldogs and nothing like being a Bulldog,” he said. The prevailing wisdom around town and on campus was that Jordan’s journey back shouldn’t have taken so long. He made three NCAA Tournament appearances and graduated in 2001 with more wins than any player in school history. After a brief pro career, he returned to Indianapolis to start his coaching career the Butler way. Todd Lickliter hired him as the director of basketball operations, promoted him to full-time assistant and then took him to Iowa, where they both worked for three more seasons. Following the coaching change in Iowa City, Jordan landed on John Beilein’s staff at Michigan in 2010-11. Three years later, Jordan was a finalist to succeed Brad Stevens. But instead of picking Jordan, athletic director Barry Collier promoted another ex-Bulldog, Brandon Miller, from Stevens’ staff. Miller lasted one season before turning things over to interim coach Chris Holtmann while he was on a medical leave of absence. Jordan, meanwhile, spent three more seasons with the Wolverines, then took his first head coaching job last season at Milwaukee. He wasn’t just waiting for a second chance, though, he was fine-tuning his coaching skills. Jordan knows what good basketball should look like. And after working tirelessly to get Butler’s program off the ground in the late 1990s and into the national conversation in the 2000s, there’s no way he’s changing the Bulldogs’ principles or style now. Martin and guard Kamar Baldwin played prominent roles on last season’s Sweet 16 team. Sure the Bulldogs will be counting on Martin (16.0 points) and Baldwin (10.1) to score, but they’re also asking them to do much more. Martin, a senior, started 21 of 34 games in 2016-17. Baldwin earned the starting guard job early in his freshman season. This season, they need both to be leaders. The other crucial leader will be senior Tyler Wideman. At 6-foot-8, 240 pounds, Wideman is not a traditional big man. But he has been a key cog on a team that annually ranks among the Big East’s best in rebounding. Now that Andrew Chrabascz has moved on, Wideman (7.2 points, 5.0 rebounds) will have to do even more of the dirty work inside. He should get some help from Martin (5.8 rebounds), 6-10 center Nate Fowler and 6-11 forward Joey Brunk, too. Chrabascz and Tyler Lewis accounted for 244 of the team’s 453 assists, or 53.9 percent. Baldwin was third with 50 assists. But Baldwin is more combo guard than true point guard, so what will Jordan do? He could go with Baldwin or he could try redshirt junior Paul Jorgensen there. Jorgensen spent his first two seasons at George Washington before transferring to Butler last season. Now, after a year on campus, he’s ready to play. He started the Bulldogs’ first exhibition game. 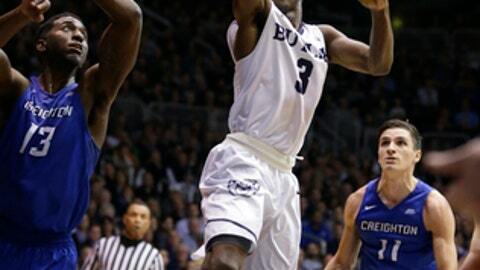 If Jorgensen excels at the point, the Bulldogs’ rotation could be much stronger. At the Big East media day, Butler was picked to finish eighth in the conference. If the Bulldogs outperform the preseason expectations, it wouldn’t be the first time. But the undervalued Bulldogs don’t seem to care what others think. More AP college basketball at www.collegebasketball.ap.org and https://twitter.com/AP-Top25 .